Senior Hailey Purves has made real progress leading the Food Recovery Network chapter she founded at the University of South Dakota, FRN’s first ever chapter in South Dakota, this past school year (2016-17). With the help of a few fellow students, she has established a strong working relationship with both the university’s dynamic food service provider, Aramark, and a remarkable non-profit partner agency, Welcome Table. The University of South Dakota is located in Vermillion, a high poverty-level community with the highest rate of low-income families in the county, not including reservations, and where at least one in five people experience food insecurity. This FRN chapter, the first in South Dakota, serves a critical need in the state. 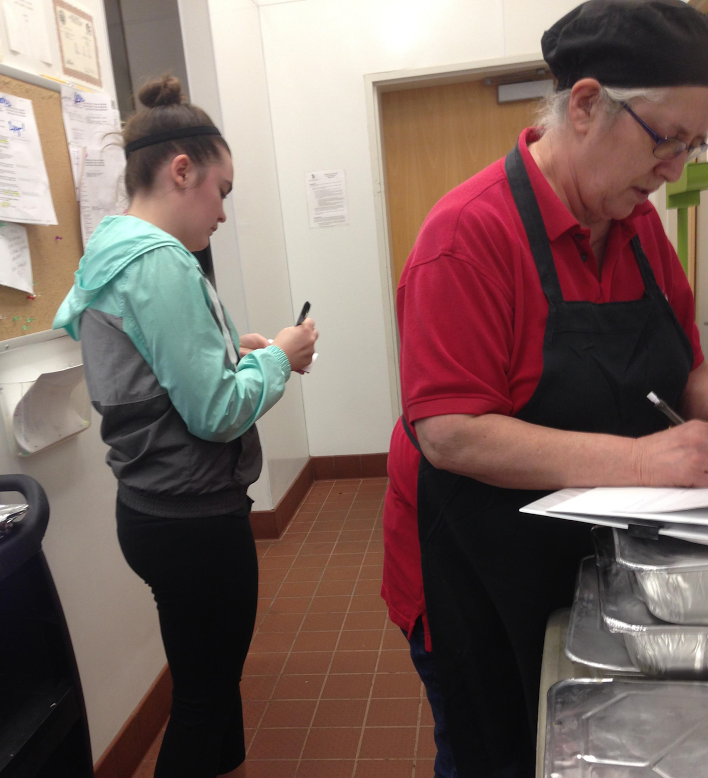 Hailey credits the ready cooperation of Aramark for making the program work so smoothly: “Honestly, we haven’t had any issues! All the people [. . .] are so nice and helpful. They have everything pre-packaged, frozen, and weighed for us. All I do is make sure I have the weights recorded, the volunteers, and the transportation to the Welcome Table.” That’s a pretty big workload, but FRN student leaders are known for their positive attitudes! Adam Chicoine, Aramark’s general manager for USD, offers a glowing description of Hailey: “The student who originally approached me about starting this program was very passionate and truly cared about helping the local community.” A graduating senior with a major in dental hygiene, Hailey is to be commended for all her efforts toward improving food security in her community. Student Megan Feerick (left) and Aramark employee MaryAnn (right) weighing the food that will be given to the Vermillion Welcome Table. Hailey Purves, in turn, has nothing but praise for Welcome Table’s founding director, John Lushbough, whom she calls “truly a great guy. He cares for so many people in this community by not only running Welcome Table but also a school’s Weekend Backpack Program and the local high school’s food pantry.” The food that the FRN chapter delivers on a weekly basis is used for all three of these programs. Food insecurity has reached a critical level in Vermillion since, according to John, it is basically a one-business town. Welcome Table serves a full dinner every Monday night for whoever wants to attend. John Lushbough founded the nonprofit sixteen years ago as a means to bring various community members together in a friendly environment and, of course, to serve Vermillion’s many citizens who are food insecure. According to John, with the contributions from Aramark that FRN delivers, Welcome Table has “more than doubled” the amount of food served. He credits FRN for providing 80% of the food, and helping him save $500 to $750 per week on food costs, making it “extremely easy” for his organization to serve 150 plus people every week. John also likes the fact that Aramark packs the food in refrigerated or frozen containers that make distribution all the easier. Any leftovers are donated to two other programs John runs. One, the Weekend Backpack Program, provides food for elementary-age children to take home on Fridays, while the other, a high school food pantry, allows students to pack their own bags with a variety of teen-appealing food choices. Even the high school’s home economics teacher has benefitted from Aramark’s donations that she uses for in-class demonstrations on how to better prepare food at home as well as make cooking more economical. University of South Dakota’s FRN chapter continues to seek other ways to ease the problems associated with poverty and hunger, ever-looming in their community. Marisa Helms, a medical biology major who, come September 2017, will be the chapter’s new president, wants to increase the amount of ‘rescued food’ by finding other sources in the community. “I also would like to get more students involved in the program to both raise awareness and give the program more support from the campus.” Sounds like the 2017 program will be in very good hands! Student John Fanta ready for delivery to Welcome Table.